From celebrities like Tom Petty and Prince, to residents of the Blood Tribe reserve located in southern Alberta, people from all walks of life are impacted by the lethal grasps of fentanyl. Fentanyl is a synthetic opioid in the same class of painkillers as morphine and oxycodone, but substantially more powerful – a dosage equivalent to two grains of salt is strong enough to kill an adult. It is a driving force behind the opioid epidemic that has swept through North America over the past decade, taking thousands of lives every year. Originally created as an anaesthetic over fifty years ago in Belgium, fentanyl is now commonly mixed with other drugs like cocaine and heroin, meaning that drug users may be taking the potentially deadly opioid without even knowing it. This has ultimately contributed to the rising number of fatal drug overdoses in Canada. When OxyContin was approved by Health Canada in 1996, it drastically changed pain treatment in Canada. Doctors began to prescribe extremely addictive painkillers more frequently, paving the way for the ongoing opioid crisis, in which fentanyl is a key contributor. According to the United Nations, Canada consumes more prescription opioids on a per-capita basis than any other country in the world. In an effort to combat the developing opioid epidemic, provincial governments stopped subsidizing OxyContin and variants of it in 2012. However, this merely led to an increased demand for opioids, as many became addicted due to the over-prescription of painkillers. To curb their new addictions, people turned to the black market, where the production of counterfeit OxyContin pills containing fentanyl began to grow substantially. One hundred times stronger than morphine and fifty times more potent than heroin, fentanyl became the ideal replacement for many, breeding “a new class of drug addicts”. As the prevalence of fentanyl continued to grow, drug dealers began to lace cocaine and heroin with fentanyl, either to save money or to make higher profits. Between 2012 and 2017, there was a 2000 percent increase in the amount of fentanyl found in “street drugs”. Out of all drugs in Canada, heroin was affected the most – in 2012, less than one percent of heroin tested contained any amount of fentanyl; in 2017, roughly sixty percent of heroin contained fentanyl. It is no coincidence that the number of fatal overdoses has steadily increased in recent years. In 2016, over 2800 Canadians – an average of eight people every day – died from opioid-related overdoses, and experts believe that fentanyl played a role in most of those deaths. While the entire country has been impacted by the rise in fentanyl-related overdoses, British Columbia and Alberta have been affected the most. In these two Western provinces, there was a combined 42 fatal overdoses involving fentanyl in 2012; in 2015, that number skyrocketed to 418. The situation has only worsened with time: in the first half of 2017, fentanyl contributed to the deaths of an average of more than four people per day in British Columbia and Alberta. From January to November 2017, over 1100 people died from a drug overdose in British Columbia alone, with fentanyl linked to 83 percent of these fatalities. The sheer strength of fentanyl makes it an ideal product for drug dealers, as a small amount can generate incomparable revenues. Furthermore, because of its unparalleled potency, fentanyl can be shipped in small packages, making it harder for border guards to detect. It can also be hidden in larger items, as was the case of the first major fentanyl seizure in Canada. In 2013, two Montreal-based men were arrested while en route to a UPS store to ship over ten thousand fentanyl tablets hidden in a microwave oven to New Jersey. The two men received the ingredients to produce the synthetic opioid from China, which is the typical place of origin of most fentanyl in Canada. While some fentanyl in Canada is produced domestically, the vast majority of Canada’s fentanyl originates from China. Due to comparatively looser drug manufacturing laws, the raw materials required to produce fentanyl are easily accessible in China. While China has banned the production and sale of a few different fentanyl variations, one minor manufacturing tweak is enough to circumvent the restrictions. Moreover, companies that manufacture illicit drugs in China face weak and inconsistent legal consequences for their actions. Given the importance of Canadian-Chinese trade, the volume and variety of Chinese imports to Canada allow for a plethora of ways to disguise fentanyl. Additionally, fentanyl is commonly purchased from anonymous users on the so-called “deep web,” a secluded part of the Internet that disguises the servers and identities of website administrators, further undermining the authorities’ investigative capabilities. As of September 2017, the RCMP had launched twenty investigations targeting fentanyl imports, and every supplier identified was based in China. While Canada’s opioid epidemic initially involved domestically prescribed drugs, the global nature of the fentanyl crisis leaves policymakers limited in their options; they have little to no control over drug manufacturing labs in China. There are, however, some policies that could be adopted to help address this growing crisis. Implementing mandatory limits on the prescription of opioids and establishing more contemporary prescription standards to reflect the ongoing epidemic is one potential policy resolution. Canadian guidelines on opioid prescriptions have not been amended since 2010, and doctors continue to over-prescribe them. That said, in both Canada and the United States – which is also suffering from an opioid epidemic – reducing the frequency of opioid prescriptions has had a contradictory result; instead of lowering opioid consumption, it has caused people to turn to the black market to feed their addictions, where fentanyl is abundant. Supervised injection sites are another potential policy response to the proliferation of fentanyl in Canada. These are places where people can consume illegal drugs with clean equipment under medical supervision, and are often equipped with naloxone, an antidote that reverses drug overdoses. Many of these sites also provide opportunities for drug users to receive addiction treatment and withdrawal support. There are currently around one hundred supervised injection sites operating around the world. For several years, Vancouver was home to the only supervised injection site in North America, called Insite. According to a five-year study, Insite resulted in cost savings of at least $14 million over ten years for the Government of British Columbia. The study also found that drug users were seventy percent less likely to share needles, reducing the likelihood of spreading diseases. Insite has also lowered the number of fatal drug overdoses. Over the past six months, Toronto Public Health has opened three supervised injection sites. Between August and October 2017, volunteers at a site based in Toronto’s Moss Park oversaw almost two thousand injections, and reversed or stopped approximately eighty-five overdoses during this time. Despite their proven effectiveness, supervised injection sites remain highly controversial. Opponents typically argue that they enable drug users and fuel their addictions. Former Prime Minister Stephen Harper certainly opposed them, as he attempted to shut down Insite, although he eventually lost a legal battle that reached the Supreme Court of Canada. 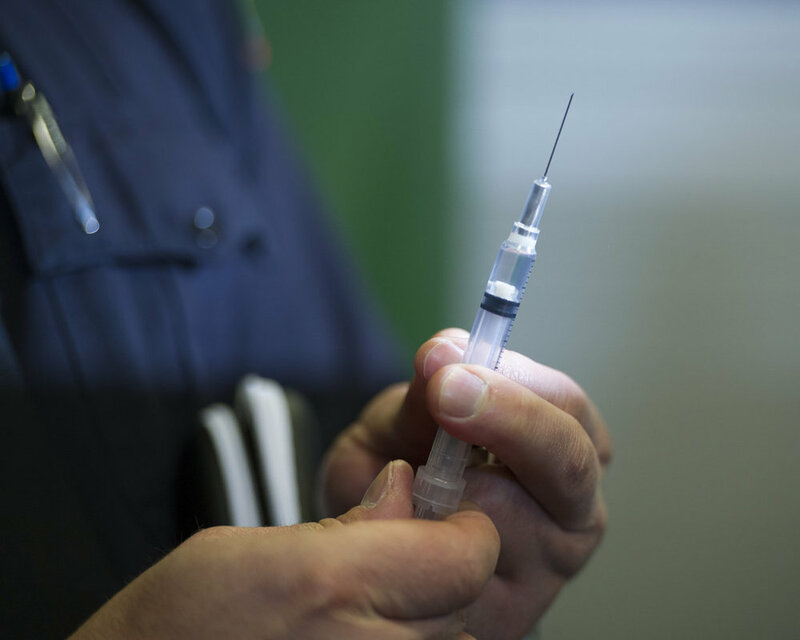 In the United States, supervised injection sites remain illegal. While it will take years of lobbying and policymaking, I believe supervised injection sites are the best course of action to combat Canada’s growing fentanyl crisis. With little to no control over fentanyl production in China, policymakers should direct resources domestically. Regardless of whether or not supervised injection sites exist, people are going to continue using drugs, and the proliferation of fentanyl does not appear to be ending any time soon. Providing addicts with a safe place to consume drugs and receive addiction treatment, while simultaneously keeping drug abuse out of the public eye and saving the government millions of dollars is a feasible, compelling policy resolution. Every day, Canadians are dying because of fentanyl; how many more lives will be lost before our government establishes a cohesive policy response?